I recently had the distinct pleasure to sit down and meet with both Jason Belcher & Brad Nelson. 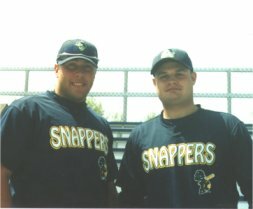 Both were extremely nice & receptive young men that also seemed to have built up a unique friendship of their own during their time spent together as Beloit Snappers. They both talked about their budding friendship, the art of hitting, keeping things simple & following their dream. Brewerfan.com (BF): Are you familiar with Brewerfan.com? Have you heard of it? Jason Belcher (JB): Yes, I have. Brad Nelson (BN): Now I have. BF: Have you heard of Toby's Power 50 at all? Do you know where your placement is? JB: I know I'm somewhere 6, 4, 5, somewhere right in there. I don't know (where) exactly. BF: Is that an area of competitiveness between players, or do you guys joke around at all about that? JB: No, no, not at all. Some guys will get on there & they'll kid you about it, but not really. BF: We have a staff member, Toby Harrmann, who writes a top 50 prospect list. BN: Am I ahead of him? BF: I think you're right around 10. BF: That gives you a source for motivation. BN: That's right. Not as much pressure. BF: I was here opening night and it was freezing, and I've lived here all my life. (Jason) now you're from Arkansas, so how's the weather in Wisconsin so far to you? JB: It was absolutely horrible for the first couple of weeks, and then we got a warm spurt, and then it got back to what, normal weather? We just got back from Appleton with wind chills of 15 degrees. Sleeting, snowing, raining, it was pretty bad. BF: (Brad) was it any easier for you? BN: I'm from Iowa, and it gets cold & everything, but we were still smart enough not to go outside & play baseball in below freezing temperatures. I don't know, I definitely enjoy the sun & everything, it's just something you've got to deal with I guess. JB: Everybody has to play in it, but no one like to play in it. You can't get loose, your joints hurt and your body aches & stuff like that. BF: Is the advantage definitely to the pitchers, especially considering the sting in the hands for a batter making contact? JB: Absolutely. Baseball is a feel game. You feel your swing, you feel the baseball when you throw it, and when it's cold, it kind of takes those things away. You don't get quite as loose and you don't get quite the grip on the baseball. Pitchers definitely have the advantage earlier in the cold weather. BF: Not too long ago, you both were still in high school. (Brad) you're only a year out of high school, & (Jason) you're only 2 years removed. What was it like being scouted during your senior year? Was it hard to focus on school? Was it hard to focus on baseball? Did you have a lot of scouts following you? Some organizations probably set up camp in your home, what was that all like? BN: For baseball in Iowa, it's just starting right now, so you graduate & your season goes on. With that, it's kind of hard because we're the only state, other than I think maybe Wisconsin, that does it that way. So, half of my junior & senior year I didn't play with my high school buddies-so I ended up my senior year playing with an AEU team. After my graduation I basically moved to Kansas City & played with a Kansas City team & moved onto the nationals. So that's where I got followed after the draft & everything. Coming from Iowa didn't help very much because our schedule was a lot different than everybody else around the nation. JB: Well, being from Arkansas it was a little different. Our season starts in the last semester of your senior year, so you're concentrating on graduating and doing those things along with playing baseball. And being from such a small town, I don't know the size of Brad's town, but I"m from a town that has 4,000 people, and I graduated with 66 people in my graduating class. So, being & playing at that level of baseball, obviously having 30-50 scouts per game is quite an experience. And it had some distractions along with it, but I wouldn't necessarily call them distractions, they were good distractions. It was a nice experience. BF: It was a good thing, it helped you stay focused? Kind of motivate you? JB: Right, right. At that level, I really didn't get pitched to my senior year, so we had a lot of morning workouts where we would go & work out individually by taking me through BP (batting practice), and run and throw & do those sort of things as opposed to the game because they really didn't get to see much. BF: You get pitched around a lot being known as one of the better hitters, so you just take your walks & get on base? BF: How close were you to attending school? You were both later signs. Was there a point in which you almost did attend college & didn't sign that professional deal? What swayed the decision? BN: It's a tough decision. The normal thing is you graduate from high school & go to college. Checking out the schools, that was a tough decision, but I ended up really happy with Nebraska & following the school & knowing what all your friends are experimenting in college. It was a lot of fun & I knew it would be a lot of fun. Yes it was a tough decision, but now I look back & I'm playing professional baseball and I can always go back and go to college. I decided this is your dream, go for it and don't worry or look back. JB: I agree with Brad there. The biggest question for me was the value of an education, which is big in today's society. But I felt like this was my dream, and I felt at 18 I was ready to come play professionally as opposed to going to college. You can go to college and still have this same opportunity, but then again you might not. You can go & have a car wreck, or blow out your knee or whatever may happen. You can't control that. So you take the opportunity that you have & you make the most out of that opportunity. That had a big bearing on whether I signed or not. I was close to signing to Oklahoma just because you have questions whether you're ready to be 18 at this level or go to college & mature a little bit, be out on your own away from your family & stuff like that. As soon as you sign, you're on your own, regardless. You're away from your parents & everybody else, and you go survive. If you're ready for that, and you're chasing your dream, it's nice. BN: Like you were saying, for us, we're both young and already in A ball. We'd be freshmen & sophomores in college right now. JB: Right. You go to college and your graduate at 22, 23-you're going to start at Arizona (rookie ball). We're 18, we started & got a jump in on the system. That's something we looked at. In three years where are you going to be as opposed to coming out of college? That was a big influence on the decision also. BF: And now you're in Beloit Wisconsin. BF: Did you both have an inkling you would end up in the Milwaukee Brewers organization? Were you surprised that a couple of other teams passed on you? JB: Being drafted by the Milwaukee Brewers was a surprise. I had several other teams show quite a bit more interest. I think the Brewers were at 2 of my games. They didn't invite me to a pre-draft workout or anything like that. They showed up for 2 games & just like everyone else they did their normal thing. I had other clubs that were at every single game, so being drafted by the Milwaukee Brewers was quite a surprise because they didn't show much interest. But, I guess they knew what they wanted, and they went after it. BF: Was it a disappointment that any of the other teams didn't draft you? JB: I wouldn't call it a disappointment whenever you get drafted, but I had different situations. I was working out in Cleveland 3 days before the draft with the big league club. I just wasn't expecting to be drafted by the Milwaukee Brewers, and now that I am drafted by the Brewers I'm very excited that it was the Brewers because I enjoy everything about the Milwaukee Brewers & I'm glad they gave me the opportunity to chase my dream. I love putting on that Milwaukee uniform.